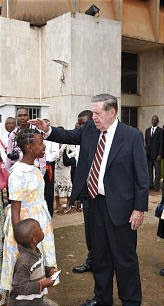 "During a historic 16-day tour of Africa on Aug. 16-31, Elder Jeffrey R. Holland of the Quorum of the Twelve dedicated Cameroon and Rwanda for the preaching of the gospel. "In so doing, he became the first known apostle to ever set foot in either nation. 'These two [country dedications] were particularly spiritual. Maybe it was because it was Africa. Maybe it was because of 'the last shall be first and the first shall be last,' with some who are getting the gospel later in our dispensation responding with such acceptance and delight. Maybe this is all part of 'an African moment.' 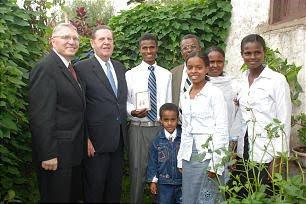 "
The African journey began when Elder Holland left Utah Aug. 16 and landed in Ethiopia's capital, Addis Ababa, on Aug. 18. While in Ethiopia, he spoke to missionaries, held a large fireside, and visited the home of Brother and Sister Yonas Haile. Their son, Fikodu, a 17-year-old priest, humbly showed Elder Holland his signed and completed Duty to God booklet. Fikodu is the first young man in Ethiopia to earn the award. "I want the Saints to know that Africa is one of the bright, beautiful emerging frontiers of the Church," he said. "It sounds ominous sometimes just to hear the word 'Africa' because we think of dangers. Like any other place there can be dangers, but for the Church and the members it is one highlight after another, one bright spot after another. "These people are so given to faith. I've often thought that perhaps the Lord in His justice, mercy and outreach made up for what they don't have in material blessings by giving them an extra measure of spiritual blessing and insight." Elder Holland referred to some literary references of Africa being "the dark continent." He said he doesn't agree with that description. What is his description of Africa? "With the gospel of Jesus Christ it's a beautiful bright light to the world."